Shoppers from all over the world head to Ohio nine times a year for the Springfield Antique Show & Flea Market. The prices are reasonable enough for resale and the merchandise is all antique or vintage — and you'll find up to 2500 vendors selling it during the May and September Extravaganza weekends. Tip: If you're serious about getting the first crack at the Extravaganza weekend goods, attend line buying on Thursday. That's when the vendors wait in line to enter the show — and when lots of them buy and sell to each other. For $40, you can be there too. 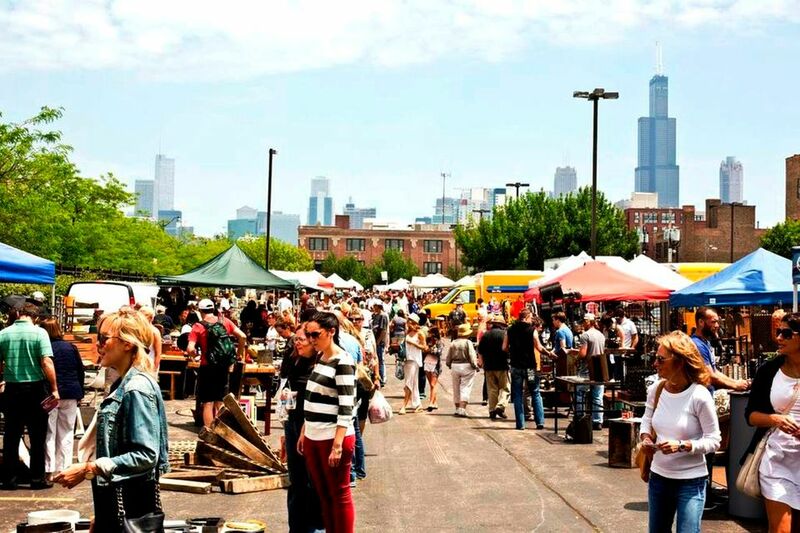 Chicago's Randolph Street Market is one of the hippest happenings in the Midwest. It's a curated market, so you won't see expired toiletries or as-seen-on-tv items. You will find fine antiques, vintage kitsch, and artisan-made offerings. The home furnishings and housewares are fabulous — and the fashions range from retro to indie-designer originals. Tip: If you're a Randolph Street Market regular, pick up a season pass for two for $200. Since the pass includes early buyer admission and valet parking, that's nearly half off what it costs to pay by the month. With nearly 900 booths, the Shipshewana Auction & Flea Market is the Midwest's largest outdoor flea market. Though historically a Tuesday and Wednesday event, Shipshewana has now added Saturday swap meets. They've upped the midweek game too, with a special section for quality vendors selling vintage goods according to a weekly theme. Tip: Download the free Shipshewana Flea Market mobile app to search for vendors selling the merchandise types you want. Then, visit those booths first — or just those if you can't stay all day. The app also sends notifications on upcoming flea market and auction events. Though a favorite of locals and those in the know, the Elkhorn Antique Flea Market at the Walforth County Fairgrounds is often overlooked by those compiling top flea market lists. It shouldn't be. The antique and vintage merchandise is outstanding — and the vendors (more than 500 of them) are ready and willing to haggle. The May and September markets are usually thought the best. Tip: Don't go to the Elkhorn Antique Flea Market without a wagon or wheeled cart (along with the rest of your treasure hunting gear). You will find lots of wonderful things, and you'll probably be parked far away. During the Sunday at Sandwich Market, the historic Sandwich Fairgrounds are filled with quality antiques and vintage collectibles. The market does allow a limited number to vendors to sell garden decor and repurposed goods, but no mass-produced new merchandise or reproductions are permitted. Tip: If you need any help at the Sunday at Sandwich Antique Show, talk to the organizers. You'll probably spot them driving the grounds in a golf cart — and they are extremely responsive to both shopper and seller needs. Every Father's Day weekend, antique dealers outnumber residents nearly four to one in Walnut, Iowa. That's because of the city's annual Walnut Antique Show, which is sponsored by the Walnut AMVETS. With a minimum of 20,000 shoppers each year (and that's a conservative estimate), Walnut calls itself Iowa's Antique City for good reason. Tip: Get there early in the morning on each day you attend. If you roll in after a leisurely breakfast, you'll be parking a long way from the market area. While walking off your breakfast might not seem so bad in the morning, you'll regret the long hike at the end of the day. For true vintage without the trendy price tags, head to Vintage Garage Chicago. Held in a three-story, covered parking garage, the market features a different theme each month, such as Mid-Century modern, Rockabilly & Vintage Clothing, and Vintage Wedding. It's worth a visit for the nostalgia factor alone. Tip: The vendors are friendly and most are willing to haggle if you do it politely. You wouldn't think a place with a single-digit population would be an antique and collectible mecca, but twice a year it is. During the Sparks Antiques and Collectibles Flea Market, the town hosts more than 75,000 visitors — and 450 of them are antiques vendors. Tip: Lots of vendors start packing pretty early on Sundays, so get there early and don't wait too late in the day to make your best offers. Downtown Oronoco Gold Rush Days is an enormous antique show and flea market that takes place once a year. The event features approximately 1000 vendor spaces selling nearly a variety of fascinating goods. You'll find everything from antique automobiles to handmade handbags. Tip: If the summer heats starts getting to you, take a break in the old Oronoco schoolhouse. It has air conditioning. Most flea market tips lists advise shoppers to arrive extra early in the morning. That advice doesn't apply to Wheaton's annual All-Night Flea Market at the DuPage County Fairgrounds. It takes place from 3 p.m. til 3 a.m. The excitement comes mainly from the novelty of shopping at such a time, but there are treasures to be found. Tip: Take a flashlight with fresh batteries and a pair of earplugs. You'll need to former to examine potential finds for dings and damage after dark. The earplugs may come in handy when you're shopping in the tent next to the live bands. Looking for a good, old-fashioned flea market? Head west from Chicago for about an hour and you'll arrive at the Kane County Flea Market. There's little you won't find there, including whatever it is you want and lots of things you definitely don't. Tip: The Kane County Flea Market is huge. Skip the booths with cheap imports and pallet loads of retail store returns. Instead, focus on snagging the best antique and vintage stuff. It is there. What Cheer is such a happy-sounding name for a town. If you collect just about anything old, you'll feel happy when you visit the town during the What Cheer Flea Market. To give you an idea of the offerings, the market used to be called the What Cheer’s Collectors’ Paradise Flea Market before organizers shortened the name. Tip: Flea markets and antique shows usually charge a hefty price for early admission. At the What Cheer Flea Market, early bird entry on the Thursday before the market starts is a steal at just $5.